We are already almost all the way through February, and hopefully you and your webmaster or who does your SEO already has a good foundation for their strategies this year. 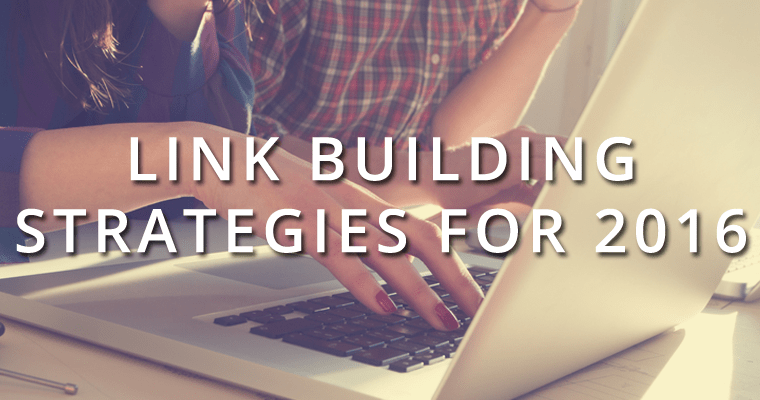 It is very important to have link building campaigns, content and citations campaigns layed out in a time frame that is stuck to through out the year. It’s not a good thing to just haphazardly put up posts and links without a strategy and time line. Links have been a very important part of getting websites ranked high in the search engines from the very beginning. It is still extremely important for rankings, but also helps to actually drive more traffic to your website naturally when these links are placed in high authority and relevant places to your site. Why Are Links Still Important in 2016? Google stopped the world with the release of Penguin in 2012. The sophisticated algorithm update took action against spammy websites, link schemes, and made us all think twice about our backlink profiles. Now, in 2016, Penguin may be presenting itself soon. 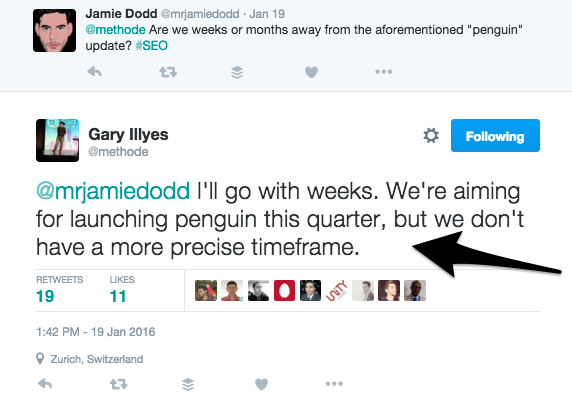 Google’s Webmaster Trends Analyst, Gary Illyes, stated we may see Penguin this quarter. And, although you may not be waiting on pins and needles for this Penguin update, it shouldn’t alter your link building strategy. Cultivating relationships online, discovering new communities, building brand value—these small victories should already be imprints on your link-planning process. While there are distinct elements of link building that are now so 1990s, the human need to connect with others will never change. The irresistible need to share LOL-worthy six-second videos, react with GIFS, or complete a sentence with emojis (???? ), people want to build that personal one-on-one relationship. Nevertheless, if Google does change their algorithm (Penguin, Panda, Pigeon, other non-animal related update), you’re still going to be marketing your brand with intentional link building. No matter how amazing your marketing strategy (or website) looks, it’s only part of the equation. A link is your workhorse: It’s used more than almost any other factor to add value to the search engines and your site. They are gritty, hard-working, and no one ever stops to marvel at the beauty of link. Back in 2014, Matt Cutts used the Google Webmaster’s YouTube channel to honor backlinks in all their glories. The subtext of this particular video is, “It turns out backlinks—even though there’s some noise and certainly a lot of spam—for the most part, are still a really, really big win in terms of quality for search results.” It was pretty awesome, but he definitely wasn’t the first person to make a search-altering announcement. Backlinks actually date way back to the Lisa Frank and TRL days. In 1999, link farm exchanges were developed to take advantage of PageRank. In 2000, email link requests were the rage. But, quickly, emails with the subject line “LINK SUBMISSION” were filtered to spam folders, earning email link requests another spot in the faded tactic category. Anna did a great job on that article with a ton of take aways. It’s well worth the time to read the full article. We are big fans about where she explains that there are pending “Penguin” and “Panda” updates, don’t sit around waiting for them and keep up your linking campaigns! One thing that is touched on in the previous article is citations. Citations are extremely important to local marketing. These are places like Google My Business, Yelp, Yellow Pages Online, etc. Owning a business is hard, and it’s even harder when you are also trying to get your local business a visible presence on Google and other major search engines. If your business’ focus is highly competitive on a local level (like automotive repair services, HVAC services or pizza delivery), you could face challenges since both you and your competitors are doing your best to get that sweet spot on the top of Google’s localized search results. While building quality links and creating a well optimized site is very important factor, you must not forget the importance of having good local citations for your business’ website. Exactly what is a citation? A citation is any reference to your local business, including your business’ name, address, phone number (commonly referred to in the search world as NAP) and any other related information, regardless if there is a link to your website or not. For example, let’s say you run a plumbing business called “Leaky Faucet Plumbing” that operates in Mesa, Arizona. Your address is 123 Fake Street and your phone number is 602-555-5555. You have a website, LeakyFaucetPlumbing.com, and you want to drive local customers to contact you for their plumbing needs. You head to YellowPages.com and submit the necessary information to have your business listed in their directory for Phoenix, Arizona. After going through the process and YellowPages.com verifies your business, your business is listed. You now have your very first local citation. Continue Reading Her Article Here….. So there you have 2 good examples of what type of links you should be building as well as more in depth explanation on citations and where to get them. Take away from these articles – continue your link building campaigns, lay them out ahead of time, stay consistent, and don’t be overly concerned with what could happen with Panda and Penguin, or whatever animals they come at you with, and TAKE ACTION!